Sunday November 8th 1896 It was a dark cold day. Will and I spent it quietly at home reading when not doing the necessary work. Monday November 9th 1896 Did baking and sewed on carpet rags. Will took two loads of corn to the valley. I feel much better. Tuesday November 10th 1896 Was busy with work. Will took load to the valley. We could not got to town after dinner for rain. sewed on rags. Wednesday November 11th 1896 Will to valley and I busy with the work. We went down town after dinner and were over home awhile. Fanny is in Chicago. 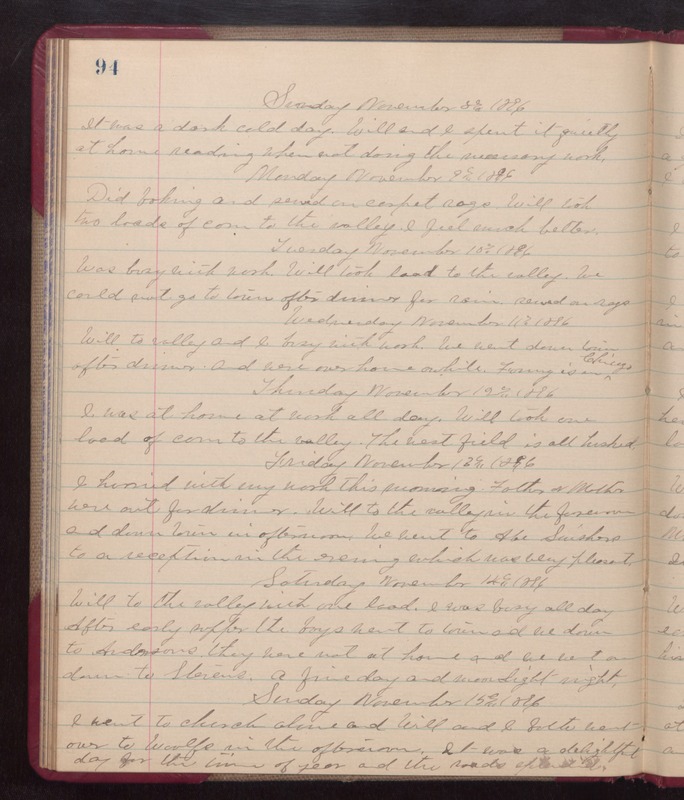 Thursday November 12th 1896 I was at home at work all day. Will took one load of corn to the valley. The west field is all husked. Friday November 13th 1896 I hurried with my work this morning. Father & Mother were out for dinner. Will to the valley in the forenoon and down town in afternoon. We went to Abe Swishers to a reception in the evening which was very pleasant. Saturday November 14th 1896 Will to the valley with one load. I was busy all day. After early supper the boys went to town and we down to Andersons. They were not at home and we went on down to Stevens. a fine day and moon light night. Sunday November 15th 1896 I went to church alone and Will and I both went over to Woolfs in the afternoon. It was a delightful day for the time of year and the roads splendid.